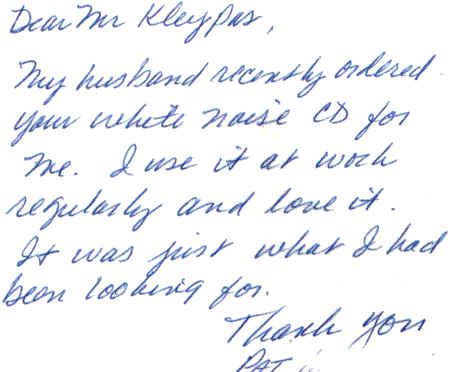 These are some of the letters that we have received from CD customers. This might also convince your boss to purchase a CD for you! Your CD saved my life. I have been using it at work for the past year. People here are allowed to use speaker phones, and I am doing computer programming. Can you imagine how I would be able to concentrate without my cd? went to the local music store and bought maybe 10 different "relaxing" cd's. They were terrible they all had animals chirping on them or music intermixed. None had the wonderful masking sounds of your white noise cd! for back up or to travel with us on vacation. I received the CD the other day. It's perfect. The internet has shown us that there seems to be a market for just about anything --including a CD with 75 minutes of wind on it. But it's brilliant -- I've lived in apartment buildings for years, and have tried a lot of things to cover up noise at night while I sleep -- fans, radio static, etc. None of them work that well, but your CD seems to be EXACTLY what I need. actually getting some work done in spite of the din outside my door! This is great! Your cd is a career saver. Thanks. We received the "Sleeptight" CD about a month ago and use it every night.Our favorite track is #2, "Gentle Breeze" (sounds more like a hurricane!). I just wanted to say that you have a great product that you are selling on your site. I purchased your three track CD a few years ago and it's made my life a bit more comfortable. I live in an apartment complex full of college students and the walls here are cracker jack thin. Your white noise CD (especially the Gentle Breeze track) helps to mask all the booming base and noise that goes on around here. Again, I would like to say thank you for making a cheap and inexpensive white noise CD that really works. I bought one of your white noise CD's a while back. I just wanted to let you know how great I think it is. It's kind of like a virtual private office! It's made me much, much more productive in the hideous cube farm environment in which I work (I'm a contractor so I often don't have much of a choice as to my office environment). Thanks for this great product!